The UK’s current political-economic system has “failed a generation” and, without change, “makes it impossible” to resolve current social and regional inequalities, according to a new report by the University of Liverpool’s Heseltine Institute for Public Policy, Practice and Place. 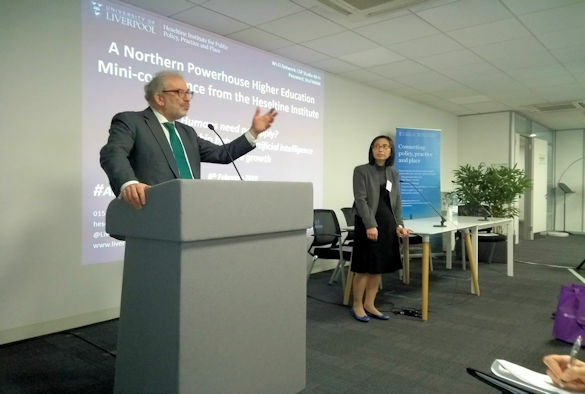 Endorsed by Lord Kerslake, Chair of the Government’s UK2070 Commission, who describes it as “timely”, the National Spatial Strategies in an Age of Inequality study assesses national spatial planning approaches in Wales, Scotland, Ireland, Northern Ireland and France in order to inform an approach to England that has been “ostentatious by its absence”. The authors; Professor Mark Boyle, from the Heseltine Institute; Dr Aileen Jones at Liverpool City-Region Combined Authority; and Dr Olivier Sykes and Professor Ian Wray, from the University’s School of Environmental Sciences, argue that three specific developments are leading to a “final exhaustion of consent” for the “prevailing neoliberal model of development”. They identify these as: austerity and “neoliberalism redux”, following the 2008 crash; Brexit; and the emerging importance of artificial intelligence and big data. Stating that “neoliberalism redux” has brought down “unprecedented pain on people”, Professor Mark Boyle, Director of the Heseltine Institute said: “Inequalities not only exist and persist but over time it seems they have widened and become more impactful. “Exacerbating already existing structures and geographies of inequality, supply side economics, deregulation, marketization, city-regional entrepreneurialism and trickle-down economics have in the end failed a generation. “Perhaps, not surprisingly then, there has arisen a new politics of inequality signalled by claims of a growing dislocation between representative democracy and popular sovereignty. The report argues that Brexit “is likely to remove or reduce EU investment in UK regions”, while the country’s future prosperity “will depend” on artificial intelligence and big data. Both factors risk “aggravating existing inequalities”. The drive for “balanced regional growth…has never been more compelling” and is needed “urgently”, it says. And while the authors concede that “quite what needs to replace unbridled neoliberalism and its actually existing and mutant forms is unclear”, they do suggest a 15 point approach that should inform national and regional planning and spatial policy. Among the recommendations are the need to support large and medium sized cities as part of a national approach that allows for “difficult investment decisions”, with the “authority to discipline decisions, behaviours and actions” outside the limitations and short-termism of the “political cycle”. Plans should be “authentically co-authored” by communities, particularly among the so-called ‘left behind’, “knit together” across borders, be supported by a dedicated capital investment fund, informed by international practice and subject to constant appraisal. Crucially, they must be delivered; “we must not pretend to plan if we do not plan”, write study authors. Welcoming the report, Lord Kerslake said: “Inequalities across the UK need to be challenged. This need is heightened by the political uncertainties brought about by Brexit and the global challenges of technological and climate change. The UK2070 Commission was launched in October 2018 as an independent enquiry into city and regional inequalities in the UK. It is due to report its findings in November 2019. Becoming An Expert: Could the future of farming be vertical?